By Sarah LaskowMore recently, though, directors who take on Peter Pan have tried to update these ideas, a tiny bit. Hook, the 1991 Robert Zemeckis movie, leaves the tribe out altogether. When the British director Tim Carroll staged Peter Pan for the Stratford Festival in 2010, he turned the tribe into Amazons. "The role of the Indians in the play is to be both exotic and a bit savage," he wrote in an email. "But the use of the term (and the stereotyped language) could only cause offense to a North American audience. It seemed to me that 'Amazons' was a neat way of killing two birds with one stone: as mythic warriors they satisfied the 'exotic and savage' criterion; but it also allowed me to cast a group of women." 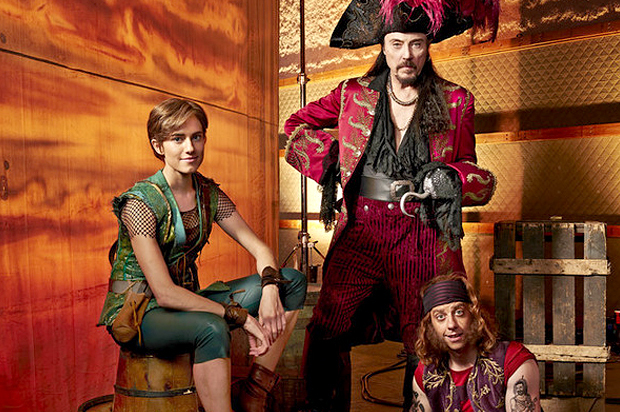 2015's Pan, a film that imagines Peter's first years in Neverland as an orphan kidnapped by pirates and forced to work in a mine, made a similar choice. The film features Rooney Mara as Tiger Lily but dresses her tribe in a sort of outlandishly bright array of pinks, purples, browns and bright blues that manages to be fantastic enough that no one would ever confuse this tribe with an American Indian tribe. As NBC prepares to screen the musical this week, Children's Theatre is working on an update that may become the standard. FastHorse consulted with the Children’s Theatre, which plans to stage “Peter Pan” next spring and which wrestled with how to portray Tiger Lily, an Indian character, and the tribe. Artistic director Peter Brosius worked with director Peter Rothstein and new play director Elissa Adams to make changes to the script in consultation with some Indian artists. They came up with an idea to change the tribe into a group of powerful, diverse girls known as the Pounce. They are a counterpoint to the show’s famous Lost Boys. 1) Omitting the Indian tribe altogether may be the best solution. It's not critical to the story; it can be replaced by a few individuals or nothing. 2) Changing the tribe to primitive people in multicolored feathers doesn't address the "exotic and savage" issue. That isn't a goal, it's a problem. Yes, some indigenous people still go half-naked and hunt with spears, but they're likely to watch TV or log onto the Internet after a day in the jungle. Equating them with fairies and pirates from a couple of centuries ago will always be stereotypical. 3) Changing the tribe to Amazon women or "a group of powerful, diverse girls known as the Pounce" is better--if they don't look primitive and indigenous. Why not dress these women like warriors from Wonder Woman's Paradise Island--in full armor? Or as gang members from a West Side Story-like background? 4) Like Tonto and Turok, Tiger Lily is an iconic, if minor, Native character. Indians have so few roles that it's a shame to lose one. Producers should think about keeping her Native--but only if they solve the "tribal" problem. If Tiger Lily isn't leading an Indian tribe, she obviously doesn't need to be Native. But if her "tribe" is a group of girls like the Pounce, she still could be indigenous. There's no reason a brown-skinned woman shouldn't lead a multi-ethnic society. For more on Peter Pan, see Peter Pan's Racist History and White Tiger Lily, Aboriginal Chief?